Raise a $2 Rainier and toast the dive bars of the past — and be grateful for the ones we still have. They just keep closing, don’t they? The Alki Taverns and Moon Temples of the bar world. I’m talking about those corner haunts and beer-and-a-shot joints, those places where everybody knows your name, or where nobody knows your name, but you can always drink in comfort. Sure, gentrification is one culprit, but it’s also true that the sun is setting on an era. Bar owners are retiring and shuttering a certain kind of bar behind them. We shouldn’t lament dive bars after they’re gone; we should praise them while they’re still with us. Here’s to all those joints with $2 Rainier and jukeboxes that blare Van Morrison at last call. Here’s to their eternal gloaming on the brightest Seattle summer days, to their pull-tabs and to their stink of late-night desperation. Below are bars I consider dives you must hit before they close. By this, I don’t necessarily mean that shutdown is imminent, but that these are irreplaceable haunts that have left an indelible mark in their ’hoods. I don’t think it’s a stretch to say they provide a community service in one form or another. And yet they likely won’t last forever in this city obsessed with the shiny and the new. My picks aren’t the most popular; they’re joints that are underappreciated, or have been on my mind — like Loretta’s Northwesterner in South Park, which is hurting because street construction is obstructing its business. Or The Cabin in Shoreline, which is being sold. Those will (we hope) survive the changes. But we shouldn’t take them for granted. 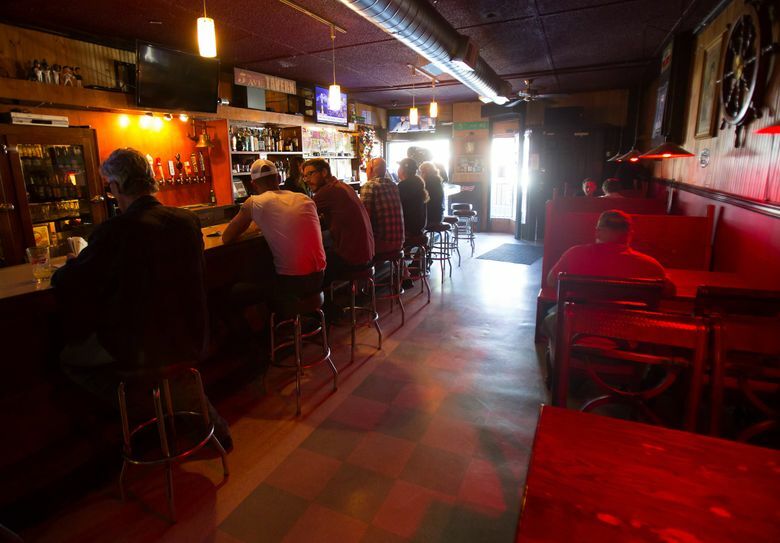 If the recent closures of dive bars have taught us anything, it’s that nothing lasts forever. “Yeah,” some regulars responded in unison. This dive got its 15 minutes of fame when word got out that the hunks from “Deadliest Catch” unwind here after crabbing in the Bering Sea. But this Ballard institution serves a more important civic function. Since opening in 1971, this family-run bar has closed on only two days — both because of death in the family. It’s a working-class haunt that opens at 6 a.m. for fishermen, California transplants and lonely hearts who need some bolstering or a home away from home. It’s arguably Seattle’s busiest bar on Thanksgiving and Christmas Day. An oaken door leads down to this medieval-like subterranean space with a Bayeux-esque tapestry of dead patricians and a griffin. It’s a place that belongs to another era, when knights were insurance salesmen and salarymen carried briefcases. In this windowless bar, the TV reception is lousy. The lounge chairs and patterned rug look to be from the ’70s — and the prices don’t seem to have changed either. Big sandwiches and other dinner specials can be had for $5.50 to $7.95. It might be the last bar in downtown not catered to the tourists and the expense-account set. The Fun House would be a more apt name. Even if you aren’t buzzed, you may look like you’re buzzed. The floor is uneven, so unassuming first-timers may stagger around as if they’re standing in a canoe in choppy waters. The slope of the bar is so steep that if you leave your drink unattended, it might slide as if a poltergeist had nudged it. 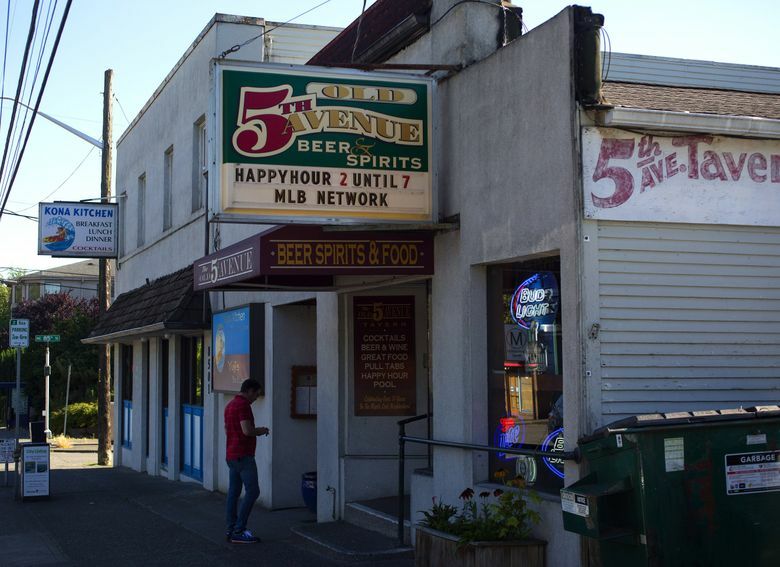 Open since 1933, this dive in Richmond Beach is in the process of being sold. Management said this institution will remain open with little change under new ownership. A couple once came to this Kirkland bar in slippers and pajamas because they didn’t feel like changing. “Yep, that’s the Central, all right,” some Eastsiders responded when I told them that story. Some eccentric characters have passed away or moved on after being priced out of the neighborhood, but the Central Tavern remains. It’s hard not to be taken in by this 80-year-old bar, by the idea that around this waterfront with lots of Microsoft money and development, an old tavern can still survive, and some oddballs can dress like it’s a slumber party and no one bats an eye. The Lexus sedan and the Tesla passing by are incongruent to the scene inside this dingy bar in Magnolia. It’s best that little light passes through the wood-slat windows because the carpets are stained and the beat-up booths are taped up. The bar is strung with Christmas lights, and its entryway often reeks of cigarette smoke. Gim Wah may be an eyesore to New Money Seattle, but it’s a wonderful relic of old Seattle. It’s on the safe side of seedy with lifers and war veterans who greet patrons by their first names. It’s “Cheers” without the laugh track. Its sign reads: “You aren’t really drunk if you can lie on the floor without holding on.” The city’s most crowded bar before 11 a.m., this corner dive in the Chinatown-International District draws drunks, day laborers, graveyard-shift workers and on game day, Seahawks fans. Whiskey shots are filled to the rim and come with complimentary beer chasers, as cheap as $4.75. So maybe posting Friday’s Sloppy Joe special near the Tums isn’t the best sales pitch. Maybe this is the city’s grittiest bar. But Joe’s can be endearing in all of its imperfections. It holds no pretense and accepts that sometimes in life, we’re dealt a bad hand and need an escape without judgment. Home to the best burger served at a dive, Loretta’s serves a charbroiled patty stacked with pickles, onions, a tangy sauce and globs of melted American cheese, bound together with parchment paper, an homage to those drive-ins of Oldsmobile years. There are six burger options to pick from, but the cheapest, The Tavern Burger ($4.50), will do fine. It’s a lumber-camp-themed bar in South Park with vintage Hamm and Olympia beer signs that bar owners on Capitol Hill would pay a fortune for on eBay. That sleek airstream trailer on the patio will be converted into a lounge soon. 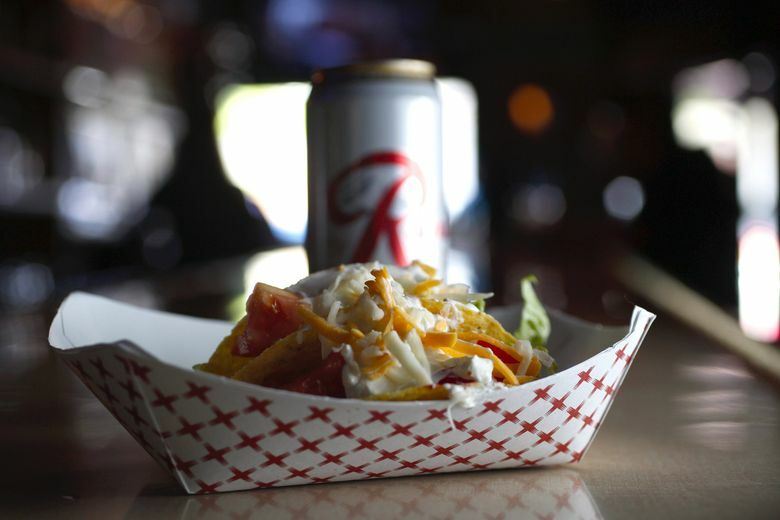 It’s a classic Northwest dive, with beer nuts, pull-tabs and old-school wooden ice boxes. Old Rainier bottles and cans dating to the post Prohibition years are kept behind a glass display like some shrine. Just as well, because that’s the beer that many locals worship — that and the cheap whiskey (under $8). This Maple Leaf bar has a convivial atmosphere, especially on Taco Tuesday (50 cents) when seemingly everyone within a five-block radius gathers as if it were town square. Here you can find the best karaoke in Western Washington. This Sodo bar is essentially eight train cars attached to each other in a parking lot, with the interior as dark as a movie theater. Rent your own private room to croon to “Careless Whisper.” Drinks are stiff ($9.50 or less) if you need liquid courage. If only your Amtrak rides were this much fun. Orient Express is where a lot of service-industry folks and those-in-the-know like to escape from the Capitol Hill crowd and the hipsters. There’s cheap Chinese food in copious amounts — that is, if General Tso’s chicken and crab rangoon are your idea of Chinese food. On a lazy afternoon, some girlfriends made a game of scanning the walls for other enlightenment. Others, though, just drank like the answer was in the bottle. Cheap whiskey and all the prerequisite macrobrews from Bud to Coors Light can be had for a song. It’s a T-shirt-and-jeans West Seattle crowd that wants little to do with the mainstream barhopping drag of California Avenue Southwest. The Baranof in Greenwood, Blue Moon in the U District, Zoo Tavern in Eastlake, Ebb Tide Room in West Seattle, The 5 Point Cafe in Belltown, Leny’s Place in Wallingford, Mac’s Triangle Pub in White Center, Palmers East in Redmond, Quarter Lounge on First Hill, The Sloop Tavern in Ballard, Targy’s Tavern in Queen Anne, The Waterwheel Lounge in Ballard and Wedgwood Broiler in, well, Wedgwood.